What Does Code P2024 Mean? OBD II fault code P2024 is a generic code that is defined as “Evaporative emission (EVAP) fuel vapour temperature sensor – circuit malfunction”, and is set when the PCM (Powertrain Control Module) detects a general failure of the control and/or signal circuit(s) of the fuel vapor temperature circuit. Note that the fuel vapor temperature sensor (also sometimes known as the “fuel tank pressure sensor) is used for leak detection in the EVAP (Evaporative Emission Control) system, and should not be confused with the fuel pressure sensor, which performs and entirely different function and is not related to the EVAP system. The function of the EVAP system is to capture and contain fuel vapors in a charcoal-filled canister before they can escape into the atmosphere. Once the PCM determines that operating conditions allow for the fuel system to be purged of accumulated fuel vapor, it opens the system to the atmosphere to allow atmospheric pressure to assist in the displacement of the fuel vapor from the saturated charcoal canister. When the system is purged, engine vacuum draws the collected fuel vapor into the inlet manifold trough a series of valves, solenoids, and vacuum lines/hoses to be mixed with, and combusted with the air/fuel mixture. For the EVAP system to function correctly it needs to be gas tight during self-test procedures, and to be sure that it is, the PCM can (depending on the application), periodically apply either a vacuum or a positive pressure to the system to test the system for the presence of leaks through which fuel vapor can escape. If the EVAP system uses a vacuum-based leak detection system, the PCM seals the system by closing the vent valve on the charcoal canister, before applying engine vacuum to the EVAP system. Based on whether or not the vacuum decays to below a predefined level within a time period set by the manufacturer, the PCM either passes or fails the system. On applications that use a pressure=based leak detection system, the PCM also closes off the EVAP system before activating a dedicated air pump to pressurize the system. Based on whether or not the pressure drops to below a predefined level within a time period set by the manufacturer, the PCM either passes or fails the system. In both cases, the rate of change in the pressure or vacuum within a set time limit serves as the basis upon which the PCM calculates the size of the fuel vapor leak, which in turn, determines which trouble code the PCM will set when a leak is detected. 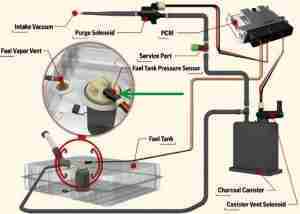 In the above examples, the PCM uses input data from dedicated sensors that are pressure sensitive. If the induced pressure or vacuum in the EVAP system changes, the degree of change produces a corresponding change in a 5-volt reference voltage, which is supplied by the PCM. The PCM converts the change in current to a pressure reading, which it then compares to pre-programmed look-up tables to determine the size of the leak. However, while leak detection systems that are based on purely on an induced change in pressure or vacuum in the fuel tank have proven to be reasonably effective, these systems are prone to reporting false positives and other inaccuracies because of the highly volatile nature of automotive fuels. At issue is the fact that the pressure of the fuel vapour is intimately linked with the temperature of fuel vapor in the EVAP system at any given time, which is a circumstance pressure and vacuum based leak detection systems cannot always cope with. To take advantage of this fact, many, if not all manufacturers have in recent years adopted the use of fuel vapor temperature sensors to eliminate false positives due to pressure changes in the fuel vapor that arise purely from changes in the temperature of either the fuel itself, or in the ambient temperature that can produce large pressure fluctuations in fuel vapors. In terms of operation, an EVAP system that uses a fuel vapor temperature based leak detection system, uses the Ideal Gas Law* to calculate a fuel vapor pressure value that is corrected both for temperature and the level of the fuel in the tank. Since the Ideal Gas Law can accurately predict the pressure at which a gas (fuel vapor in this case) must be at any given temperature to within about 5% or so under most conditions, the PCM’s ability to diagnose leaks in the EVAP system is greatly enhanced. Since if the temperature of the fuel vapour is constant, the pressure must necessarily also be constant, and any changes in temperature will therefore produce a predictable change in pressure. Therefore, should a leak suddenly develop in the EVAP system, the drop in pressure will bring about a predictable drop in temperature (as per the Ideal Gas Law) and, the PCM can therefore use the rate at which the temperature drops to calculate the size of the leak in the EVAP system more accurately than is possible with other types of leak detection systems. 2) The system can calculate compensation factors to correct pressure values that change when for instance, the fuel temperature suddenly decreases if a vehicle is removed from direct sunlight to an undercover parking facility. In these cases, the system uses a previously measured temperature reference point, such as when the fuel vapor was at its highest temperature. This means that false positives are largely eliminated, since purely pressure based leak detection systems often interpret sudden changes in the temperature of the fuel as leaks in the EVAP system. Where is the P2024 sensor located? The image above shows a schematic diagram of a typical modern EVAP system, in which the fuel vapor temperature sensor is indicated by a green arrow. Note that gaining access to this sensor for the purposes of testing and/or replacement requires the removal of the rear seat on passenger cars and most SUV’s, while removal of the fuel tank itself may be required on most pick-up truck models. Note however that there may be other sensors present on the fuel pump canister that could easily be confused with the fuel vapor temperature sensor. For this reason, it highly recommended that the manual for the affected application be consulted to locate and identify the fuel vapor temperature sensor correctly to avoid a misdiagnosis. What are the common causes of code P2024? NOTE: Unless other EVAP system related codes are present along with P2024, it is unlikely that other major components of the EVAP are implicated in the circuit failure. However, if other EVAP and/or fuel system codes are present, these codes must be resolved in the order in which they were stored before a diagnostic procedure for code P2024 is attempted. Failure to do this will almost certainly result in a misdiagnosis, wasted time, and additional damage to the vehicle’s electrical system, as well as the unnecessary replacement of expensive parts and components. None found. Ask a question about P2024.